The Forrest Gump Bench, Girl Scouts Historic Site, And The Beach… See What Else Is On My List Of Fun Things To Do In Savannah Georgia! Savannah, Georgia, is a city with an exciting array of fun things to see and do. I visited the city for the first time with my girlfriend, who had seen the the historic Atlantic port city before. Savannah — which was established in 1733 and became a Civil War battleground in the 1860s — is a Southern tourist destination for those who love history, art, and culture. Whether you’re arriving by road or by air, you’ll find Savannah Georgia pretty easy to get to from virtually any place in the United States. As for us, we traveled to the city by car and arrived via I-16, which serves as a direct east-west route into the city for folks traveling from the north or south via I-95. If you’re flying into the city, no worries — Savannah-Hilton Head International Airport is nearby. There are many hotels and motels located in the city, including the Hyatt — which has a beautiful property adjacent to the Savannah River in the heart of the downtown area. We stayed a little further from the city proper, in a mid-scale motel adjacent to an I-95 exit in the nearby Pooler area. Traffic getting into town during the morning was a little hectic. Rush hour in Savannah doesn’t seem as bad as I’ve seen in bigger cities like Boston, New York City, Philadelphia — or even the Tampa area, where we live. But it’s still worth planning a good extra half an hour or hour into your day, if you’re staying outside the city and you want to see the sights during the morning hours when most folks are heading into work. As you’d expect, there are plenty of good restaurants in Savannah. But if you’re looking to prepare your own grub, there’s Publix and Kroger — both are excellent local grocery stores. The first thing I wanted to see in the city? The park where the 1994 history drama Forrest Gump was largely filmed. My girlfriend wanted to see the birthplace of Juliette Gordon Low, who established the Girl Scouts. While I never had visited Savannah before, I was familiar with the area. In 2011, I attended a family wedding on nearby Tybee Island — which serves as a destination in its own right and also is Savannah’s nearest major beach. 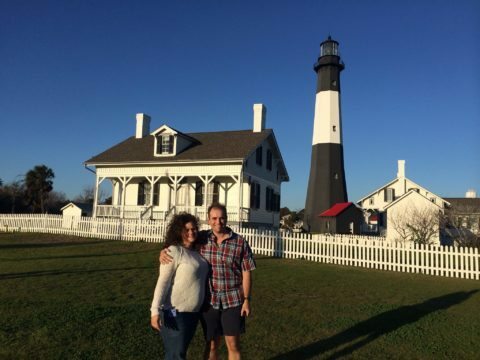 Tybee Island features a beautiful lighthouse and Victorian cottages. And I simply had to catch a sunrise from the Atlantic-facing Tybee Beach — which is often referred to as Savannah Beach. There are also parks, churches, cemeteries, and museums that we wanted to see during our short stay in the area. We didn’t take it, but there’s also a Savannah trolley tour that helps visitors get around town and see many of the more popular and historic sites in the city. The Juliette Gordon Low Birthplace is one of the top places to visit in Savannah. The original Girl Scouts headquarters is located in a grand, historic home that very much suits the city’s early American backdrop. The house museum celebrates the life and times of Juliette Gordon Low, who established the Girl Scouts in 1912. The home was threatened with demolition in the early 1950s, but the Girl Scouts stepped in with fundraisers to help purchase the home — which was converted into a museum in 1956. It takes anywhere from 45 minutes to 2 hours or more to enjoy the Juliette Gordon Low Birthplace. There’s also a gift shop at the museum where you can buy Girl Scouts souvenirs, including handicrafts made by young Girl Scouts members. OK, Forrest Gump fans… you’ll probably be disappointed to find out there’s no Forrest Gump bench at Chippewa Square, where 80% of the movie Forrest Gump takes place. However, Chippewa Square (or Forrest Gump park as some might call it) still looks about the same as it did when the 1994 movie was filmed there. It’s one of several green plazas located throughout the city, and it’s totally free to visit. 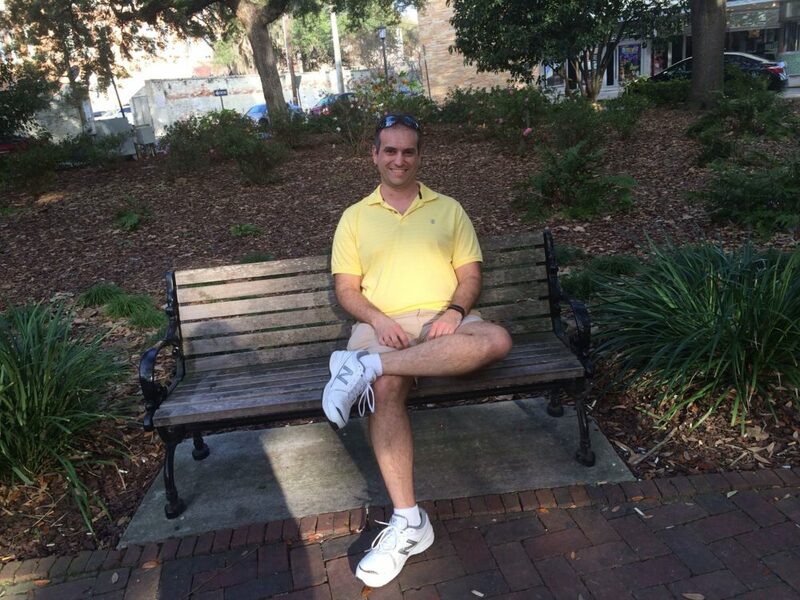 So, where is the Forrest Gump bench location? If you want to see where the Forrest Gump bench was set during the movie, you’ll need to head to the north side of the park near the corner of Hull and Bull Streets. As for the Forrest Gump park bench itself? You can now see it at the Savannah History Museum! There’s the Forrest Gump bench and a whole lot more at the Savannah History Museum. This landmark sits in the Central of Georgia Railway Train Shed in Tricentennial Park and houses a wonderful collection of artifacts and relics showcasing the history, art, and culture of the city. The Savannah History Museum takes you on a trip back to 1733, when the city was originally established. Here’s current info on ticket prices and operating hours for the Savannah History Museum. 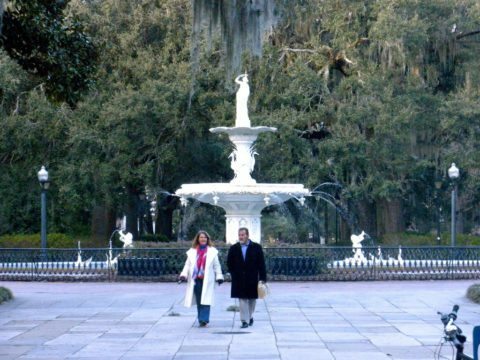 There are many parks in historic Savannah, but none bigger than the 30-acre Forsyth Park. 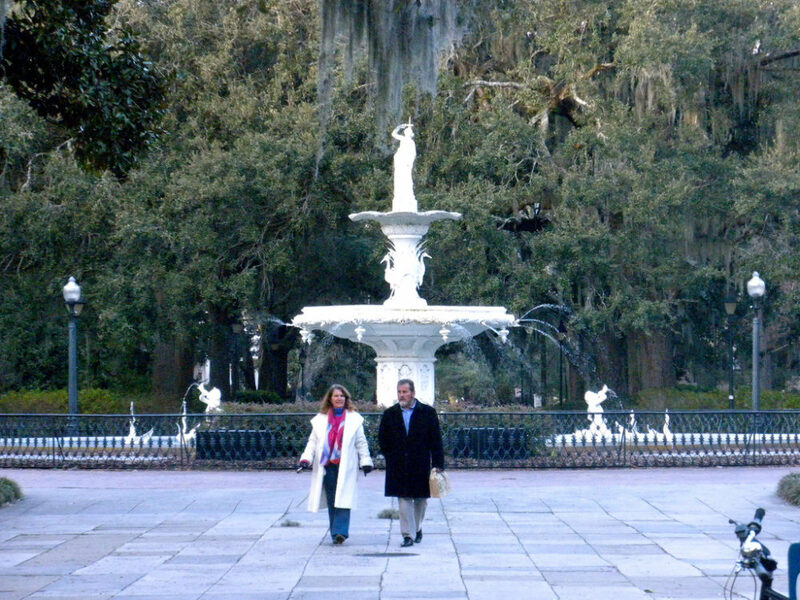 Forsyth Park is bordered to the north by Gaston Street, on the south by Park Avenue, and sits between Drayton Street to the east and Whitaker on the west. The public park is a top recreation spot in the area and serves as the city’s central park. The park was established in the 1840s. It’s anchored by a picturesque water fountain that was built in 1858. A Confederate monument was dedicated there in 1879. Other landmarks include an outdoor theater and snack bar. This Roman Catholic cathedral in the heart of the city is a draw, whether you’re devoutly religious or simply a fan of French Gothic-Revival architecture. The Cathedral of Saint John the Baptist features twin spires that can be seen from many areas of the city. The church was completed in 1896 and has a colorful history — it was nearly destroyed by fire in 1898, but was rebuilt by 1899. Subsequent renovations in the 1960s, 1980s, and 2000s have helped keep the local landmark operating as a functioning church where Mass is held every day. The Savannah River not only is one of the main landmarks in the city, but it also divides Georgia from neighboring South Carolina to the north. The Savannah River was once a main waterway for local industry and shipping vessels coming in from or bound for the nearby Atlantic Ocean. Today, the river mainly serves as a scenic backdrop for the historic city. Shops, boutiques, hotels, and other landmarks face the banks of the beautiful river. One of the most architecturally beautiful bridges in the region, the Talmadge Memorial Bridge, spans the Savannah River and is heavily travelled by those driving between the cities of Savannah and nearby Hilton Head, South Carolina. If you’re driving your own car, you’ll find several good places to park near the river. These include public parking lots along Savannah River Street, which is a shopping and restaurant hub along the river. 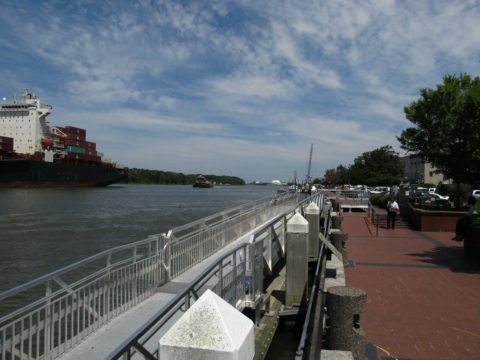 Take the opportunity to visit Riverfront Plaza and stroll the scenic Savannah Riverfront walkway. The SCAD Museum of Art offers locals and tourists a more contemporary slice of local culture. The primary mission of the Savannah College of Art and Design museum is to help educate students attending the Savannah College of Art and Design. Of course, this top-flight institute also enriches the lives of locals and tourists who visit the museum. This Savannah art museum is based in a building that was built in 1853 and offers a large permanent collection of works. These include the Walter O. Evans Collection of African American Art and the Earle W. Newton Collection of British and American Art. Exhibitions include diverse works by the likes of Jane Alexander, Sigalit Landau, and Yinka Shonibare. Be sure to check out the info page on the SCAD Museum of Art website for details on admission prices, hours of operation, and their current list of exhibits.